The model number is CKW-SW002-01. COOKOO, The Connected Watch. Have you ever lost your smartphone around the house or car?. COOKOO will easily help you find it with the press of a button. Never be left out of a picture again and no more selfies! The Cookoo watch is a smartwatch designed to pay homage to the analog watches of the past and connect with your smartphone to keep you updated while on the go. It features an analog design and uses an LCD display to light up the various icons on its face. This minimalist design allows Cookoo models to last several months on a single battery, so you don't need to charge it every couple of days. 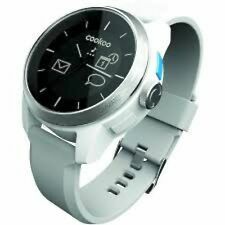 What features does the Cookoo watch offer? Cookoo offers a wide range of colors for their watches, including pink, blue, white, black, and silver. It provides alerts whenever you receive a phone call, text, email, chat message, social media notification, and calendar alert. The watch is water-resistant up to a range of 330 feet, making it a versatile accessory for active users. All Cookoo models use a replaceable cell battery that users can install. The screen displays a standard clock featuring an hour hand, a minute hand, and a second hand. On the top middle of the screen, it will display the time as well as the date in text. The LCD screen will display icons for your phone, battery life, calendar, text message, and more. Users can customize which icons are shown by customizing specific apps with the watch. It will bring up the appropriate icons and notify you when your phone has received a missed call, Skype chat notice, or even a calendar alert. What smartphones and devices does it work with? The smartwatch syncs with a wide range of phones and devices. It will work with the iPhone 4s and up. Aside from the iPhone, it will also work with other Apple products like the iPod Touch 5th Gen and up as well as the iPad 3rd Gen and up. The watch is also compatible with the Android OS as long as it is release model 4.3 or newer. As a result, it can work with many different mobile phone and tablet models. Can you control how you're alerted? Yes, you can make it alert you silently by having the appropriate icons come up. You can also have it alert you on vibrate, ringtone, or both. The command buttons located on the watch allow you to manually check in on your connected apps or activate them. When you want to turn off a recent notification, it can be done by using the buttons located on the bezel. How do you connect the smartwatch to your phone? Users can download the company's free app in either the App Store or Google Play store. Once the app is downloaded, you can follow the instructions to connect the watch to your phone using Bluetooth. Users will be able to choose which apps trigger the notifications. Finally, users can use the four buttons located around the bezel to navigate along the apps and see if they are synced properly. Content provided for informational purposes only. eBay is not affiliated with or endorsed by Cookoo.